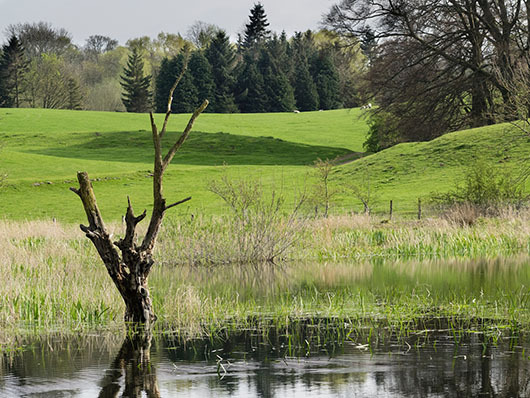 The fishery at Jervaulx includes the south bank of the River Ure and extends from Harker Beck mouth at grid SE 166 860, to Kilgram bridge, grid SE 191 860, together with the three stocked lakes in Jervaulx Park, at grid SE 180 854. Entry to the estate is at the gate at SE 184 855, which is at a right angled bend in the road a few hundred yards to the west of Lane House on Kilgram Lane. The main estate track leads down to the fishing after a cattle grid. Parking for the lakes should be at the car park adjacent to lake three, at grid SE 180 855, as shown on the map above. A track leads to the car park starting immediately adjacent to the eastern boundary of lake two, just be aware that the lake is not visible as you set off down the track, but will come into view as you breast the first rise. Members are particularly reminded to shut the gates, as the sheep in the park are particularly partial to the grass within the fenced area around the lake. The view south from the car park is shown above. This is one reason why no-one ever leaves the syndicate. Parking for the river is at approximately grid SE 175 863, although the Ure has taken things into its own hands by washing away the site of the original car park. The track down to the river leads down to the east of the ruins of the Abbey to a gate in a wall under the shade of a group trees. From there, the way is less distinct and runs across the fields, through another, disused gate, towards the apex of the bend of the river. We would request that members follow the tyre marks as much as possible in order to preserve the pasture from damage. New members are advised to consult the supplied maps and the OS map before departure. The ground is acceptable for two wheel drive vehicles in dry weather, but cars with rear wheel drive may experience difficulties when the grass is wet or when the ground is soft. The fishing in the lakes is for stocked rainbow trout, which are in excellent condition and rise well to hatches. The fishing in the river is for stocked browns, as well as wild browns and grayling. The grayling fishing is less good than it once was. Note should be taken that breeding herds are kept on the estate and members must ensure that all possible precautions are taken not to disturb or endanger stock. When driving on the Jervaulx estate ground in particular, members should be careful to proceed slowly and with every possible caution. The Jervaulx Abbey beat has some stretches that may be accessible to persons with minor disabilities, but not to those who require wheelchair access. There is reasonable access for handicapped persons to lake two and three. Members and their guests might well like to investigate the facilities at Jervaulx Abbey, particularly the tea shop!